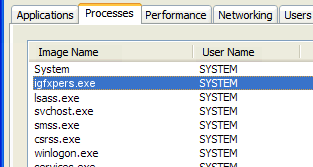 You might have noticed igfxpers.exe process running in the task manager. It's a little bit difficult task to understand which program it belongs to. Don't take tension it's not a virus, malware or spyware. Igfxpers.exe is a process that provides configuration options for Nvidia graphics cards. It's neither a virus file nor a system file. This process is from Intel, when you install Nvidia Graphic card or any other Graphic card then at that time this process is installed. It's not an essential window process so you can disable it to save your memory and to stop annoying pop up messages. Keep in mind that disabling this process may prevent the Nvidia graphics card from working properly. But if you want to increase booting time of your computer then just disable it. Its function includes enabling display resolution settings to persist when a monitor is disconnected or turned off; without it, according to Intel, the display would lose its resolution every time it was turned off. Intel says it is critical to proper running of the display driver as a whole and should not be shut off (Source : Neuber). As I told above that this process is not a virus or malware, you're completely safe from it. But still if you think that this process is consuming or eating system resources then you can easily disable it. Press Window Key+R to open Run, now type msconfig in the text field and hit enter. Now move to Startup Tab and then uncheck "Intel common User Interface and click on Apply to save changes. And that's it, you will no longer see this process in your task manager. So this was all about how to disable igfxpers.exe process in task manager. If yo have any query or doubt then feel free to leave a comment below in the comment section.